We landed in Los Angeles after a five-hour flight from Boston and made our way to the rental car desk. We were going over the details of our rental when I randomly asked, “Do you happen to have any fun honeymoon upgrades?” The sales associate responded without hesitation, “We certainly do!” And with that we were given our sparkly, 4-door, automatic, 4WD Jeep Wrangler! We were so excited! Our first item on our Traveler’s Joy registry was our “sporty wheels” to cruise the US 1 Pacific Coast Highway. We really wanted a Jeep Wrangler so that we could put the top down and still be ‘rugged’ as my new husband would say. But I was a little concerned about driving a manual jeep all the way up the coast and through Canada on winding and bumpy roads. So the upgrade was fabulous! We had our top down, our playlist ready with all of our favorite songs, plenty of snacks, and each other. We were ready for our two-week road trip honeymoon! Jaime and I were married on June 5, 2010 on the beach in Florida, close to where I grew up. We had a fabulous beach party wedding, stayed in Florida a few days and then headed back to Boston, where we both had been living the past several years, to work for the rest of June. Jaime was given an amazing opportunity to work in Melbourne, Australia for a year and so we were set to make our international move on August 1, 2010. I quit my job and Jaime finished residency at the end of June and we packed up our little Boston apartment and moved all of our stuff and our still boxed and untouched wedding gifts to Jaime’s parents’ house just outside the city, where it would all stay until we returned from Australia. We initially wanted to plan a beautiful honeymoon in Tahiti or Fiji, budget-depending. But Jaime’s little sister was getting married on July 31 and we felt it would be too much to fly half-way to Australia for our honeymoon, just to fly back to Boston, and back again to Australia. We kicked around a few islands and places like Mexico and Dominica, but then decided to save a little money for the move and instead do a fun and scenic road trip from Los Angeles to Canada. Traveler’s Joy really helped us map out our trip, and in researching what to put on our registry, we discovered some really great activities to do along the way. The best part was the comments that our family and friends included with their gift, which were usually tips and suggestions for things to do. This was a special touch that made it personal and fun for everyone. We had our route mostly mapped out with plenty of activities and stops along the way and we left July 3rd for our first stop in sunny Santa Barbara, CA. We knew going into it that this wasn’t the most romantic honeymoon idea, but we love traveling, especially on the road, and so we planned a few special stops to ensure we were relaxed and even a little pampered, thanks to the advice from our family and friends. Waiting a month after the wedding to go on our honeymoon was great for us since it gave us a chance to absorb the memories from the wedding and still look forward to getting away. The last few weeks back in Boston were anything but relaxing, we were extremely busy. So for our first stop in Santa Barbara, we stayed two nights so that we could unwind and relax before hitting the road. We stayed at the Fess Parker Doubletree right on the beach, which we loved, and since it was unnaturally chilly that weekend, we spent some time exploring the vibrant town center that included beautiful shops, fun cafés, restaurants and a local brewery. Thanks to our honeymoon registry, we rented bicycles and hit the streets. As we alternated between riding our bikes and stopping to eat, shop, or grab a drink, Jaime decided he could definitely live there and was scoping out appropriate locations for an office. Fourth of July day was also quite chilly, and so while people were setting up their blankets and BBQs for a day of hanging out prior to the fireworks, we decided to hike to one of the hot springs to warm up. We picked a trail in town and began our “leisurely” hike. We soon found ourselves climbing rocks and walking along a narrow and barely marked cliffside trail. After hiking for quite awhile, we weren’t sure if there was a hot spring, so we asked one of the few people we saw along the way. Apparently there was no hot spring on this trail, but we did make our way to Tangerine Falls, which was really cool. We felt our hike was fulfilling and then realized we were starving! We kicked ourselves for not bringing some sandwiches and laughed our way back down the mountain, almost 2 hours, to the bottom and ate at the first place we saw. Later, we brought a bottle of wine and a blanket and sat outside our hotel on the beach for the much-anticipated 4th of July fireworks! We clinked our wine glasses and gave cheers to the start of an exciting honeymoon. The next morning we were off! Our next stop would be Big Sur, a four-hour drive. Along the way we took in the beautiful landscape of the coastline on our left and huge mountains on our right. We stopped at several beaches to watch kiteboarders and put our feet in the sand. We picked up some delicious strawberries from a roadside stand and we snacked, sang, and enjoyed the crisp, salty air. We stopped for lunch at Morro Bay and later spent some time watching the huge elephant seals nap on the beach, there were so many of them! We stopped to take pictures of the zebras outside the Hearst Castle, and dug our feet into the warm black sand of Moonstone Beach in Cambria. Not too far outside of Cambria we began our climb into the mountains. The two lane road winded around the mountain with a huge rockface on one side and the most breathtaking view of the great blue Pacific Ocean on the other. The road alternated between climbing up to magnificent heights with incredible vista points and heading downhill into green and rocky valleys with creek beds and camping areas. We arrived at Lucia Lodge in Big Sur just as the sun was beginning to set. The lodge rested right on the cliff and once we settled in, we had nothing else to do but sit on the porch and watch the colors of sunset thrive over the wide blue sea. We went up to the main cabin for a delicious dinner made from fresh ingredients brought in from the farms just north of Big Sur. We spent our first night on the road in a simple cabin on a cliff, with a bottle of wine and not a care in the world. We woke up early and wasted no time getting back on the road. We were very excited about our first stop just up the way at a little hidden gem called Pfeiffer Beach. It was overcast and unusually cold for this time of year, but we didn’t care, this stop was not to be missed. The road to Pfeiffer Beach is two miles down a tiny dirt route right off US 1 and would definitely be missed if you weren’t looking for it. Once we got to the bottom, we parked the car and walked down the short tree-shaded walkway. We turned the corner and were let out onto the most beautiful little beach. Pfeiffer Beach is unexplainably a special place. With mysterious rock formations, crashing waves, and purple sand, you can’t help but stay for as long as possible just to take it all in. This was one of our favorite spots. We continued our travels north and made our way out of the mountains. We stopped for lunch in the sweet boutique area of Carmel and checked out the seaside homes, local beach, and the scenic drive around Pebble Beach golf course. We took pictures of the lone tree that grows on top of a rock at sea and the area known for its amazing view of the coastline with sea lions basking in the sun. Our next stop for the night was just an hour up the road at the Monterey Plaza Hotel and Spa. We checked into a cozy room and headed to the spa for a dip in the rooftop Jacuzzi. There’s nothing better than sitting in a warm rooftop tub with your husband, while the sun beats down on your shoulders, balancing out the chill of the crisp ocean wind. In the morning we checked out the Monterey Bay Aquarium, which was just as great as everyone had said it would be – and then continued up the coast. We stopped in Santa Cruz for a coffee and snack, and a new warm hoodie for me so I didn’t look the same in all the pictures, which we still laugh about. We rolled into San Francisco just in time to meet some great friends for dinner and drove on to spend our first of three nights in Napa Valley. What a treat! We loved Napa! Thanks to Traveler’s Joy we were spoiled rotten. We stayed in Calistoga at the Mount View Hotel and Spa. Our little suite was named after a special winery and had so much character. We enjoyed a dip in the naturally heated pool and experienced the famous Calistoga mud bath followed by amazing afternoon massages. We were given complimentary passes to two wineries, handpicked by the staff when we checked into our room. We mapped out our route and in the morning we stocked our car with two big bottles of water and a freshly baked loaf of bread (a little tip from our friends back home). It was 80 degrees and perfectly sunny and so we took the top off the jeep and began our day. We loved just about every winery we visited that first day. Vincent Arroyo’s vineyard – picked by our hotel – was definitely our favorite. We pulled up to a little barn tucked into the vineyard and immediately felt welcome. We were given plenty of tastings and even an in-depth tour of the wine-making process and the vineyard. 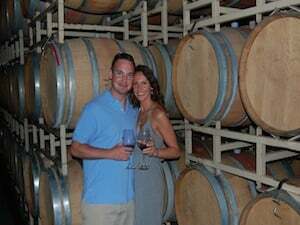 We enjoyed every minute spent at this family-run winery and took a few bottles for the road and our honeymoon celebration. What better way to spend a day than in wine country, tasting all sorts of wines, free as a bird in the warm sun? We even bought a special bottle at an out-of-the way vineyard to age at home and open on our anniversary. We spent three fun and relaxing nights in Napa, the most spent in one place so far on our trip, and we still didn’t want to leave. We said goodbye to our lazy days in Napa and headed back toward the coast to drive the remainder of Northern California to our first stop in Oregon. We drove through many small northern towns on a relatively flat highway until we reached the highlight of this stretch, the Redwoods. They were mesmerizing. We were driving in bright sunlight until we entered the Redwood forest where these beautiful giants only allowed flickers of sparkling sunlight through their leaves. We hopped out of the car to see how we sized-up next to these towering pillars of wood and we felt so tiny in the midst of their wisdom and grandeur. It was really awesome. At nightfall on the eighth day of our road trip, we left California and crossed the border into Oregon. We stayed that night at Flores Lake Bed and Breakfast. We arrived late and let ourselves in for the night and in the morning we awoke to a delicious home-cooked breakfast, warm company, and friendly conversation. We checked out the scenery of Oregon that included the sand dunes and a few National Parks and special lighthouses. We took an elevator down the cliff to sea level to check out the sea lion caves, literally roaring with excitement! It was really cool to see the sea lions just chillin’ in their natural habitat. We ate fresh seafood in tiny Newport and made our way to Portland to stay the night with some friends. We had a great night full of laughs, great food, and really great wine (Thank you Napa!). At this point, we decided to make a few changes in our itinerary. We had initially planned on driving through Seattle to Vancouver staying the night and then hopping the ferry to Vancouver Island the next day. Instead, we decided to drive up the west coast of Washington and hop the ferry to Vancouver Island all in one day so we could check out Victoria. The drive through Washington consisted of forest and the tiniest lakeside towns you've ever seen. We made it onto the ferry on standby and watched Mt. St. Helen tower in the distance as we left the US and headed to Canada. We found a place to stay in Victoria, a vibrant island-plus-city atmosphere, and took suggestions from the locals for dinner, which included oysters and microbrews. We left early the next morning for our primary and most anticipated destination on Vancouver Island. Tofino is a unique and sweet little vacation town, three hours from Victoria on the west coast of the island. This was our splurge. We stayed at the Wickaninnish Inn, a beautiful resort on the beach with the feeling of a luxurious wood cabin with panoramic ocean views, great for whale watching. Tofino's only warm month is July and the highest temperature may reach the upper 60s in the middle of the day. July is the perfect time to honeymoon in Tofino! We could relax in our personal soaker tub, sit on our balcony overlooking the ocean, or sift through a magazine we borrowed from the library while sitting by our warm fireplace with room service knocking on our door. We took a walk out to the beach at sunset, climbed on the rocks, gently held starfish we found in the tide pools, and examined the clam colonies exposed to the elements while waiting for the tide to come back in. While sitting on the beach we saw our first Bald Eagle nest and two Bald Eagles intermittently soaring boldly through the air, hunting, and then diving into the water with amazing speed and precision. We slept well that night and the next day we headed into town for whale watching. We saw several huge blue whales, playful sea lions, and tons of marine birds. We came back to our hotel that evening for the highly recommended crab cookout -- all-you-can (crack) and eat fresh crab, gourmet sides and salads and a fantastic smore pit for the perfect dessert on the beach! We were enjoying ourselves so much that we re-splurged and added an extra night to our stay at the Wickaninnish, which they were very happy to accommodate. The next day we did some more exploring and rented wet suits and surfboards for a few hours. Jaime loves to surf and I wanted to learn. What better time to do it than in the surfing town of Tofino! We wet-suited up, booties and all for the frigid water, and Jaime gave me my first surfing lesson. We had a blast! While Jaime was teaching me what to do on the shore, I asked him about the "best way" to fall to not get hurt and he told me that most people don't get up their first time, so I shouldn't worry about falling. But I made him tell me anyway...you know...just in case. (wink wink). I got kicked around quite a bit, but eventually had a few good rides standing tall on the small waves into shore! It was a great day surfing with the best teacher around, who was very proud of his student! We tried to make time stand still that night so we didn't have to leave our new love. Tofino was a magical place, peaceful, and serene and just the perfect grand finale to an amazing road trip. We drove the three hours back to the east coast of the island along the scenic road and spotted a baby black bear crossing the road. 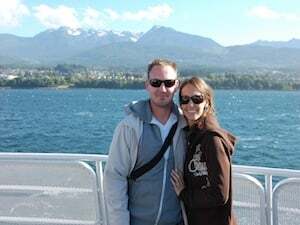 We took the ferry to Vancouver and spent the night in the Wedgewood Hotel where we were greeted with a complimentary honeymoon bottle of wine and box of chocolates! We had a great time in Vancouver and plan to go back someday to spend some more time. On the 15th day of our trip we leisurely, and somewhat reluctantly, drove to Seattle for our flight back to Boston. We had planned to have some time to check out the fish market in Seattle before heading to the airport. But the border took so much longer than we had planned (two hours!) that we actually missed our flight home! If there is one time to miss your flight home, it is now, on your honeymoon, with no job, no appointments, and no obligations. So we said a bittersweet good-bye to our trusty Wrangler and settled into Seattle for a little bonus honeymoon time. We took the first flight out in the morning and as the plane took off, we sat, perfectly relaxed and just by looking at each other we knew what we were both thinking at that moment: "What an amazing honeymoon!" I turned to look out the window and just as we rose above the clouds, there she was, Mt. Ranier, summit and all, as mystifying as ever, standing proud and magnificently above the clouds, and sending us off to start our new life together. We drove 3,500+ miles and spent a little less than $4,000. The trip itself and all the experiences and memories are matchless. Thanks to Traveler’s Joy we were able to send special thank you cards with pictures of our unique experience to each person who gave us the memory. We also inspired two of our friends to take honeymoon road trips and gave them the greatest gift of all... Traveler’s Joy!